Mavic Air vs Mavic Pro Comparison – Which is the right one for you? Were you thinking about getting the new DJI Mavic Air? But you are not sure whether it’s an upgrade to the Mavic Pro or Mavic Pro Platinum? This comparison between the Mavic Air vs the Mavic Pro Platinum will give you a complete overview on what you can expect from DJI’s new Drone. This review is supported by two of my videos. The first one is covering the whole unboxing and all the physical differences between the Mavic Air and the Mavic Pro Platinum. The second one will compare in a technical deep dive all the improvements and differences between the two drones. Now let’s talk proportions. While the Mavic Air is folded, it’s almost as big as the Mavic Pro. If you take a look from the side you’ll notice, that the Mavic Air is only the half of the Mavic Pro. The Moment you unfold both Drones, the size of the Air gets even more impressive. When you take a look at the wingspan you’ll notice that the Mavic Air 20 cm shorter than the Pro. It’s impressive what DIJ was able to achieve in just one year of time in development. A bunch of the equipment got redesigned in the process. What I really like is the design of the Charger and the new Shoulder Bag. The New Charger finally got portable. The old Mavic Pro Charger was always way to big. You never could fit in your bag. The New Charger even finds it’s Place with all the Batteries in the Bag. Also the New Shoulder Bag is a huge design improvement. The Fabric they used is comparable to a rigid jeans and it offers way more room than the old Mavic Shoulder Bag. You can fit the Drone, Controller, two additional Batteries, the Charger and even some additional equipment in there. What else has changed? DJI dropped the Micro USB on the Drone and replace it with a USB-C Connector. 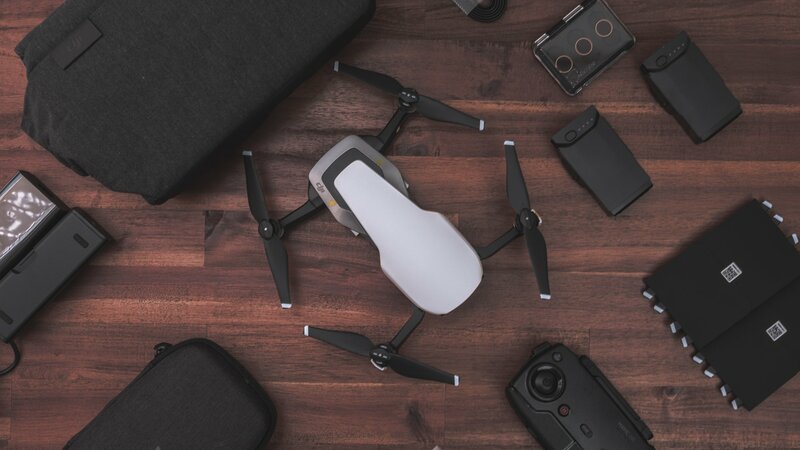 Now you are able to store up to 8GB of Footage internally on the DJI Mavic Air. On the other hand they don’t throw in a 16Gb micro SD Card anymore. Those 16GB don’t last long with the new codec anyways. Depending on your FPS settings somewhere around 11 minutes. Is the Camera of the Mavic Air better? Sure the physical improvements on the Mavic are great but under the hood even more has change. DJI advertised that they bumped up the Bandwidth for the Mavic Air’s Camera from the 60Mbit of the Mavic Pro to 100Mbit. Those numbers are interesting but how do they actually affect your footage. For this I took the same scene and zoomed in on it to see how the details are. The first thing you’ll notice is the fact that the Mavic Air Footage is darker than the Mavic Pro’s. This can be observed throughout all the footage. No matter if it’s Videos or Photos. On average it seems that there is a difference of EV 0,3 between the two drones. Even though the Air’s Footage is darker, it has way more details in it. Especially if you look at the leaves. The Mavic Pro always had problems with “fine detailed” areas like treetops. The same thing can be observed on the leaves and twigs in these pictures. But of course not everything can be better on the Mavic Air than on the Pro. Otherwise DJI couldn’t justify the Pro on it. The first things I noticed when I was setting up the Air, is the fact that it is lacking Cinema 4K. That means the Mavic Air is only supporting a resolution of 3840 x 2160 (UHD). The Mavic Pros both are supporting 4096 x 2160 (Cinema 4K). 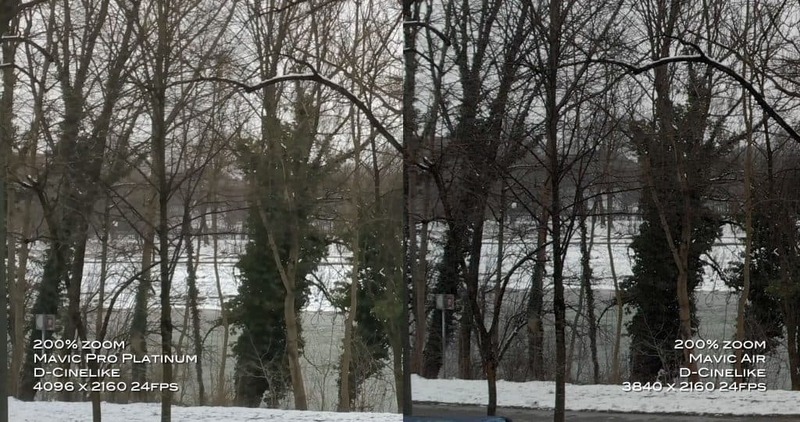 With the lower resolution I can live, since the Image Quality of the Mavic Air has significantly improved over the Mavic Pro. What really bummed me out is the lack of a D-LOG Profile. Sure D-Cinelike is also a flat Picture Profile, but D-LOG is flater. Thankfully this can be easily fixed with a firmware update so I’m keeping my hopes up. Mavic Air or Mavic Pro Platinum? One of the biggest struggles with the Mavic Pro is the Tap to Focus Feature, or let’s say the whole focusing. If you own a Mavic Pro you know what I’m talking about. The chances of coming home with blurry footage was rather high. Thankfully DJI decided to get rid of this feature on the Mavic Air. That means your camera has a fixed focus and you’ll always get that nice crispy image the moment you take it out of the bag. When I was comparing the Footage of the two drones I accidentally stumbled upon another improvement on the Mavic Air. DJI improved the whole gimbal design on the Air. Placing it further in the Housing and making it more rigid. So you finally don’t need to worry when you put on your ND Filters. These changes led to a way higher shock resistance. Meaning you’ll have a smoother image under rough conditions. Lately with every new Drone DJI is releasing more new Quickshot Modes. This time we got two. The Asteroid and the Boomerang. The Asteroid is a rather special on. When you start it, it’ll fly backwards and ascende to 40m. The moment the Mavic Air is reaching it’s highest point, It starts to take a panoramic picture. Those two are then combined into an impressive video. It’s a nice features but i don’t see myself using it in the longrun. With the Boomerang it’s a whole different thing. The Mavic Air is engaging on an elyptic course around you. This Quickshot Mode is the perfect way to reveal an impressive vantage point. I’m certain this one will make my life way easier. In the past you always had to check your surroundings and make sure there were no obstructions in your way. With the Mavic Air DJI introduced new Sensors to the Mavic Family. This is the first time a Mavice received backward facing sensors. These sensors make the backward pans safer than ever. DJI didn’t stop there. They also introduced a new Assistant called APAS. This one proved to be more accurate then I would have ever expected. When APAS is activated, the Mavic Air is automatically scanning it’s surroundings and adjusting the flight course accordingly. If you are maneuvering around difficult terrain, I reckon this new feature could be very helpful. When we take a look at the flight performance, there are two things i didn’t like too much. Number one being the fact the Mavic Air is using Wifi between the Drone and the Controller. The Range is limited to about 350-450m. This works great while you are out in the wild. The moment you get close to civilization this could change dramatically. Number two being the flight time. Considering the size of the DJI Mavic Air, it’s impressive what they managed to shove into this tiny body. But sometimes you just need a few extra minutes. Tapping out somewhere around 20 minutes sometimes just isn’t enough. Since the Mavic Pro Platinum is offering us on a good day something around 25 minutes of flight time, you’ll definitely have to adjust to the shorter air time. Is the Mavic Air better than the Mavic Pro Platinum? The Drone itself is very beginner friendly and it’s easy to maneuver. With the Mavic Pro you’ll definitely need to be a better pilot. With that said, if you don’t own a drone jet, or you want something more portable, the Mavic Air is the perfect companion for you. If you want a Drone that can cover vast distances and conquer high winds, the Mavic Pro is the better choice for you. If you already own a Mavic Pro or even a Mavic Pro Platinum, I doubt it’s necessary to sell it for a Mavic Air. The DJI Mavic Air is absolutely an amazing piece of work. I can’t wait to see what DJI has in store for us this year. Maybe we’ll see a new Mavic Pro 2 somewhere this summer? Either way, they raised the bar when it comes to our expectations.